Aloha Exchange Club President Jay Kimura presents an 'Officer of the Month' plaque to Sergeant James Correa. The Aloha Exchange Club of East Hawaiʻi recognized Sergeant James Correa on Thursday (January 24) as the East Hawaiʻi “Officer of the Month” for January. Correa was honored for his leadership role in capturing two escaped inmates. On December 5, two inmates escaped from Hawaiʻi Community Correctional Center after overpowering and assaulting a correctional officer. 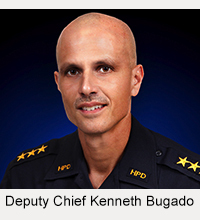 In the aftermath of the escape, the Police Department formed two teams, one from each side of the island, to lead an intense manhunt for the escaped prisoners. Sergeant Correa was assigned to lead the Area I Task Force in East Hawaiʻi, while Sergeant Bradley Freitas was in charge of the Area II Task Force in West Hawaiʻi. The two teams worked together tracking down all leads. Due to their commitment, one prisoner was arrested in Kaʻū two days after the escape. The second was tracked down a week later in Puna. 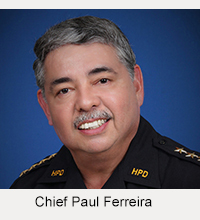 Captain Robert Wagner, who recommended Correa for “Officer of the Month,” said that the task forces worked for long hours to protect the safety of the public and that citizens were grateful for their dedication. The Kona Crime Prevention Committee holds a separate award ceremony for West Hawaiʻi officers on the first Wednesday of every month.